Today’s all about DNF’ing (Did Not Finish). I have a difficult relationship with DNF’ing. On one hand I am a big supporter of DNF’ing because really, there is not enough time in life, so why spend it on books you’re just not liking? But on the other hand, I rarely DNF myself. Because I always think it’ll get better. Most books take a little time for me to really get into, and I don’t want to lose the opportunity to miss out on a possible favorite book, just because the beginning was a little hard. And honestly, it happens more often than not. This was just so tough to read at first. The writing style took me almost 40% of the book to get into and I almost DNF’ed. But I’m happy I didn’t because I loved the rest of the book soooo much. I just didn’t care or even like any of these characters at first. Which is weird, because they ended up becoming some of my favorite characters EVER. I already almost didn’t pick this up because the idea of a cyborg cinderella did not appeal to me. But I did and honestly, Cinder was an average read. I almost didn’t continue the series, but I’m happy I did because the rest of the series was AWESOME. Say what? I know, this is one of my favorite series now. But those first few chapters, I really struggled. Honestly, even though it’s a classic, it was tough to get through and I almost DNF’ed several times. But in the end, I’m happy I finished it anyway. It’s a classic for a reason. Another case where I struggled with the first book, but ADORED the rest of the series. How easily do you DNF? Any books you almost DNF’ed, but are glad you didn’t? This was an interesting topic this week. I think Lord of the Rings could be on a lot of lists, I know when I was younger the first part of Fellowship of the Ring felt like such a slog. Yes it was tough to read, but I’m still so happy to have read it! 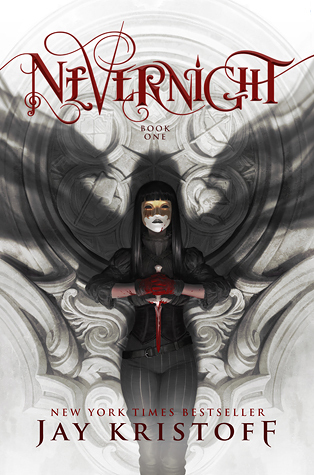 I’m glad you didn’t give upon Nevernight because it’s really great. I should try The demon king again, I read a lot of positive reviews about that book. Nevernight was amazing indeed! 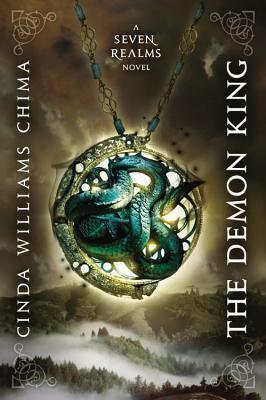 I definitely recommend the Demon King, the series only got better for me with each new book. I love your take on this week’s topic! I agree, Cinder is a bit of a slow start to that series, but it definitely gets better. LOTR is certainly a classic for a reason. It is a bit slow at times. I think you just have to be in the right mood for it. Great list! Here is our Top Ten Tuesday. Thanks! The Lunar Chronicles definitely get better with each new book! 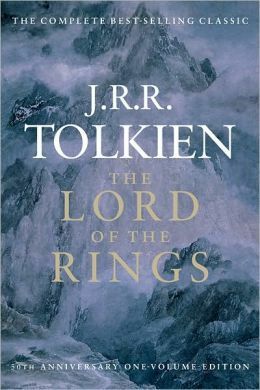 LOTR was tough to get through, but it was still an amazing read. I think I only DNF a book if it gets on my nerves, it gets offensive or if it’s just boring but veeery long (if it’s short I do finish it), because it often takes me a while to get a feel for things and I’m also aware that my bad mood can affect how I’m seeing the book and that maybe if I persevere something will click and then I’ll love it. I have a terrible memory, but I remember that it took me a while to get into Mistborn – actually, most of high fantasy books, but when it clicks, I LOVE those. It just hard to know when to give up hope, right? Yes exactly! Just because a book isn’t clicking right away, doesn’t always mean that it’s not meant to be so that thought keeps me from DNF’ing a lot. I very nearly DNFed The Raven Boys too and am also really glad I didn’t! 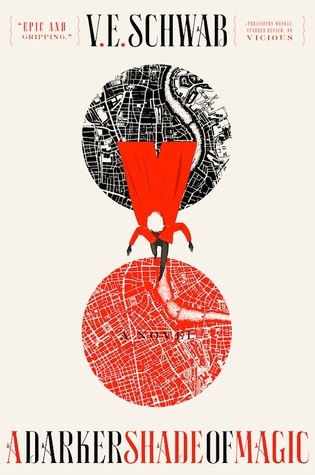 I actually didn’t have any trouble with ADSOM, I was hooked from the beginning, but I have heard of others who did. 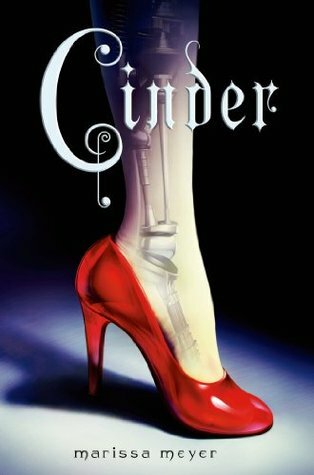 I wasn’t that keen on Cinder either, but I liked the second book better. Glad to hear I’m not the only one who had a little issue with The Raven Boys and Cinder, but ended up happy we didn’t DNF 🙂 Yay for liking ADSOM right away though! 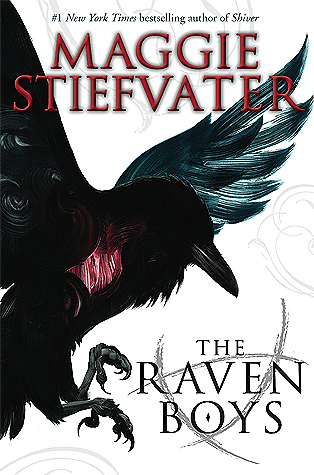 I hear so many people that had a hard time with The Raven Boys the first half and were close to dnfing it. I loved it from the start though haha. I nearly didn’t pick up Cinder again either and I now love the series. Great list! I’m so glad you powered through with Cinder! The Lunar Chronicles is one of my favorite series. I also have issues getting through the first couple chapters of Schwab, but I’m going to circle back around to it because so many people love her books! I’m sure I will too if I can JUST. GET. TO THE GOOD STUFF! 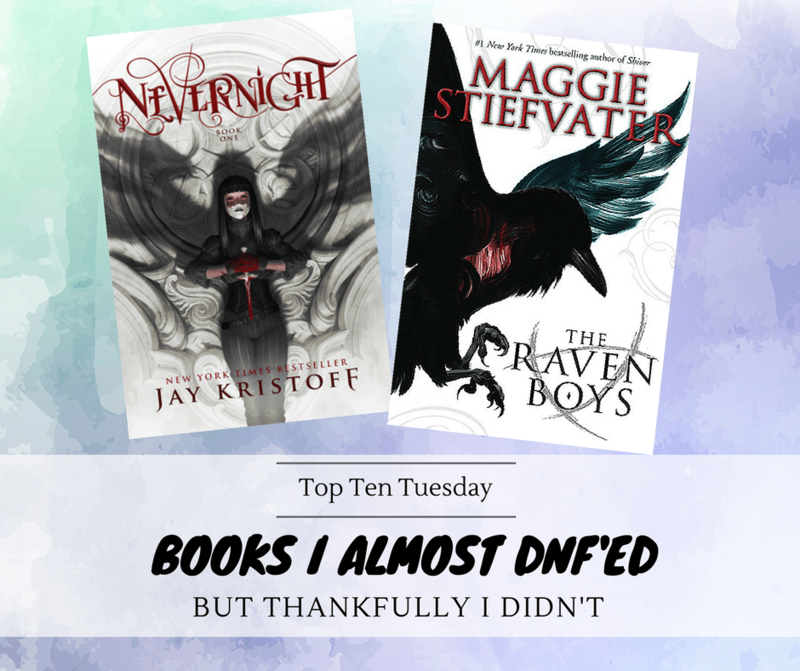 I almost DNFed Nevernight too! Like you, I’m so glad I didn’t though. I felt the same way about LOTR, I slogged through so much of it, but I was glad I made it through in the end! I can definitely see why it took you a while to get into some of these and I’m super glad you were able to finish and enjoy them in the end! What a great list. I had the same experience with Cinder and TLC! I’m glad I kept going though!